This is 60km+ of relentlessly technical terrain, designed to test your mountain running, strength, endurance, speed, balance and skill to the max. From grassy trods and well-worn mountain paths, to bare rock and scree, bog and open fell, we’ve packed in a bit of everything on this fully marked route. Starting in the grand and victorian grounds of Patterdale Hall, the Lakes Sky Ultra has undergone some serious developments for 2019. The newly developed route starts you at the original halfway point for the old course, starting the ascent of Boredale Hause with-in a few km's of the start. Heading north now instead, ascending to the summit of Place Fell, which over-looks the race start and the beautiful Ullswater Valley. Once the summit is gained, true Lakeland trails lead you to a fast and rocky descent into the valley of Boredale, before heading back south again to ascend the classic Beda Fell ridge-line. This new deviation brings you back into the original course and passing Angle Tarn on your left you will start the ascent to High Street before taking the wild and rocky ridge-line of Long Stile and Rough Crag, dropping you down to the valley floor of Haweswater and your first re-fuel of the day. From the Haweswater CP you now head into the wild and remote valley head containing Small Water before climbing to reach Nan Bield Pass (Windy Enclosure Pass), turning west you climb passing Mardale Ill Bell before sweeping round the head of the Kentmere Valley to pick up Thornthwaite Beacon. A steep, rocky and loose descent traces you through Threshthwaite Mouth, with the rocky ascent out to gain the summits of Stoney Cove Pike and Caudale Moor. Sublime running from here takes you along St Raven's Edge to your second re-supply point of the day at Kirkstone Pass. Now you climb hard, up the open fell and rocky gullies to reach the summit of Red Screes. Remember, this is one of the KoM stages sponsored by Leki UK, with your chance to gain points to win the overall KoM Super Stages challenge, a race with-in a race! The running from the summit into Ambleside is one of the best descents in the Lake District, bringing you into the north side of Ambleside and a chance to re-fuel well stocked Midway checkpoint at the University of Cumbria. Now the fun really begins with a long ascent of the east side of the Fairfield Horseshoe with some little cheeky rock steps on-route, topping out at the summit of Dove Crag. Rocky and technical running takes in Hart Crag and Fairfield summits before a rocky and scree-ridden path drops you to Grisedale Hause and another leg burning ascent to the flanks of Dollywagon Pike, Nethermost Pike and finally the summit of Helvellyn. A quick dive to the north-east drops you down the uber-technical ridge of Swirral Edge (grade 0.5 scramble) and the amazing descent into the Red Tarn Cove. You now descend the main 'Helvellyn Track' into the Glenridding Valley (home of Mountain Run) to the old mine workings before taking the 'miners' track back up into the Greenside Valley and though the saddle at Nick Head dropping into the hidden valley of Glencoyne. Fast and technical descending brings you to the penultimate ascent over the eastern side of Sheffield Pike to descend down a bone shaking single track and back into the valley of Glenridding. Now with the finish almost in-sight you make the final ascent via the Rattle Beck Bridge climbing to Lanty's Tarn and using 'private trails' through the woods of Keldas and Hall Bank, back into the finish at Patterdale Hall. The route will be fully marked and flagged. There will be no navigation on route required, but navigational experience and skill maybe needed in the event of loosing the flags and is pre-requisite for a race entry. The above image, with thanks to Harvey Maps, shows the provisional race route. There is likely to be some refinements before the race itself. Please keep an eye out for updates as they happen. Underfoot terrain will be mixed. Grassy trods, well worn mountain paths, bare rock, scree, single track trails, hard/technical ascents and bone shaking descents will all feature on this fully marked route. Use of hands will undoubtedly be required. There will be a safety team on the hill, with marshalled control points at high-level locations along the course. Drinks stations will be at Haweswater, Kirkstone Pass Inn, and Ambleside with a food/nutrition available at Haweswater and Ambleside. Due to the nature of the terrain, competitors will need to carry their own food and drink for significant sections of the course, and finish with at least 200 calories of emergency rations. However, we encourage racers' families, friends and support teams to make their own way to marshalled points on the fells and at road crossings, preferably with a Cow Bell (these will be available to purchase on the day) or two to add to the atmosphere and character of the race. 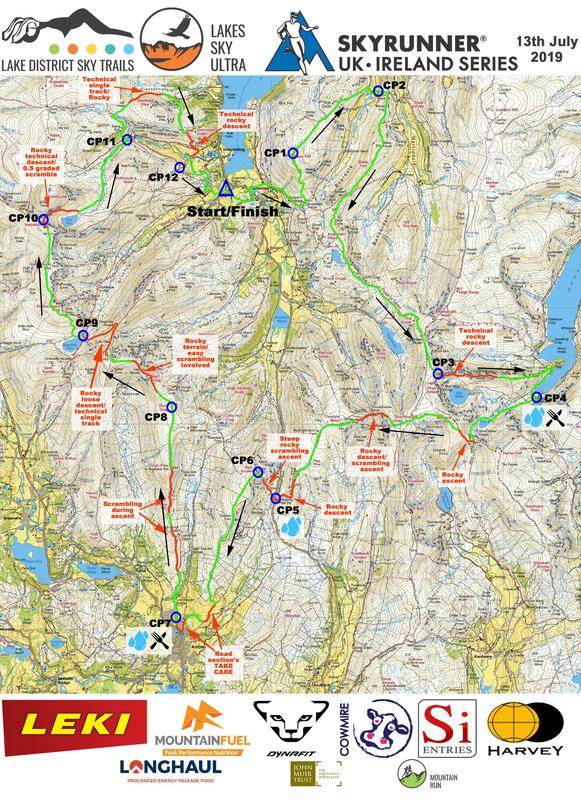 There will be a cut-off at Kirkstone Pass (Time TBC) and Ambleside (Time TBC), to ensure timely completion of the race route in daylight hours. Sunrise will be at approximately 05:10 with sunset at approximately 21:27, with the race running between the hours of 06:00 until 21:00. A bottle of specially labeled cider and a hot meal awaits you at the Patterdale Hall. The route is fully marked and flagged, and no navigational experience is required to follow the route, but is part of the race entry requirements. A safety team will be present on the fell, and there are marshalled control points at high-level locations along the course. In certain extreme conditions, the reduced Bad Weather Route may be used. Designed with the safety of competitors and the race team in mind, the Bad Weather Route retains as much of the spirit of Lakes Sky Ultra as possible.